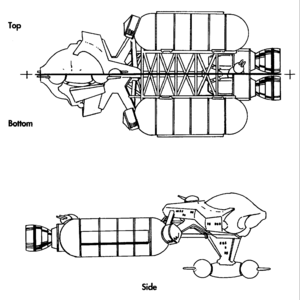 Dorkir-class line drawing from Joan's Fighting Spacecraft. The Dorkir was a Kilrathi transport. It was included in Joan's Fighting Spacecraft Vega Sector Supplement for 2654.092. Freighter/Tanker: The two most common layouts for any class of transport. Command Staff: Equipped with an additional communications and sensor suite, this version of the transport is used by high ranking officers to coordinate system-wide military efforts. The Confederation invasion of the Kurosawa System was bolstered by an early strike against a Dorkir-class command staff ship, the loss of which sent Kilrathi resistance into disarray. The design has also been used in the dedicated Thrakhra-class Command and Control vessel. Troop Transport: A single Dorkir may be outfitted to carry a unit of one thousand warriors - ten times the number of Terran marines carried on-board a similarly sized transport. Though a vital part of any war effort, tactical treatment of the Dorkir is evidence their cultural disdain for support staff. Two examples: In an attempt to relieve the garrison at the Brimstone System during a Confederation blockade, the Empire deployed dozens of lightly escorted Dorkir at once - hoping that a few might make it through to the planet. During anti-piracy efforts in the M421A System, Thrakhath's forces sacrificed an entire Dorkir as bait to lure out the enemy. The Terran Confederation Space Forces Academy maintains a captured Dorkir on which students train for ship to ship boarding scenarios. The Dorkir was used alongside the Lumbari variant. Dorkir-class as seen in Super Wing Commander. This page was last edited on 8 September 2012, at 22:35.